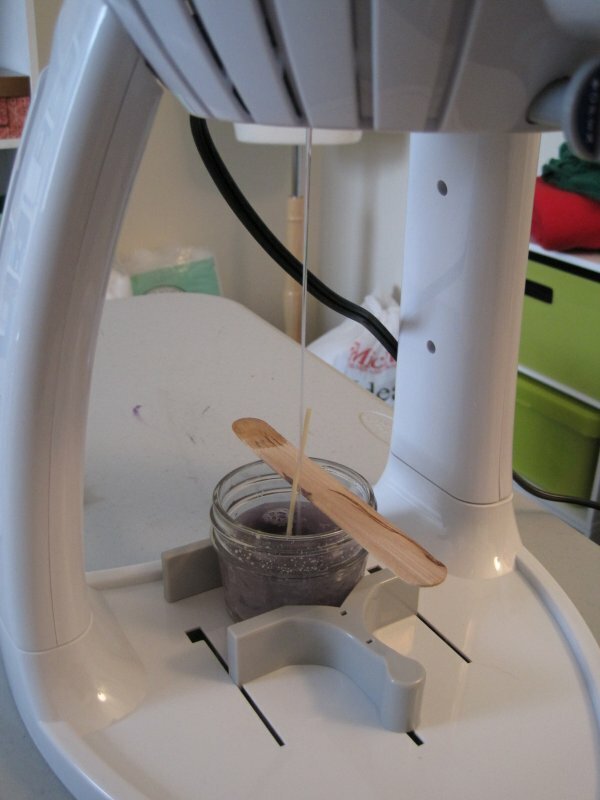 The Candle Creations candle making machine. 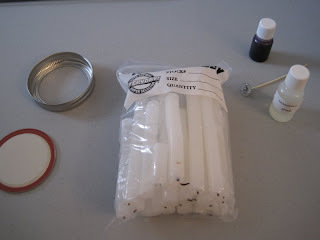 I've always wanted to learn how to make candles, and though through research I know the normal method isn't exactly rocket science, I opted to give this gadget a try to avoid using my stove and needing a thermometer. 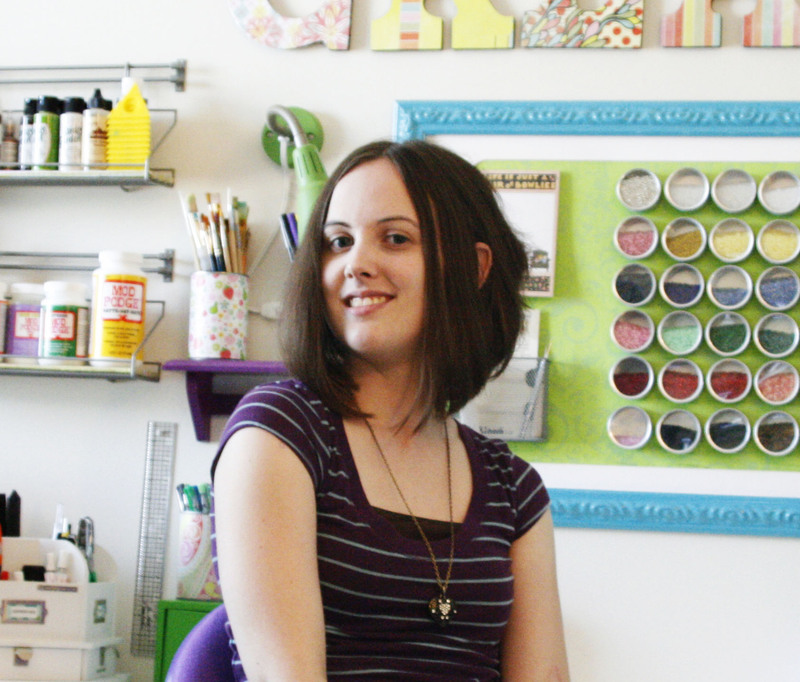 I can also do it in my craft room which is a huge plus for me because I am a major lover of multitasking. The machine retails for $39.99, but buy it with a 40% off coupon which brings it down to about $24. 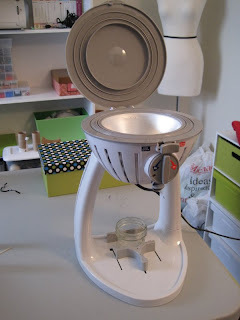 The machine includes everything you need to dive right in, but I bought some other goodies for my first go 'round since I planned to use it to recycle some old candles. After plugging in the machine and reading through the instructions I got my materials ready: Wicking, fragrance, dye, and a small canning jar (which you can only see the lid for...the jar is already on the machine). I also have baking soda nearby just in case this thing catches fire. Always be prepared, you know. The candles also came from work. We do wedding rentals for candelabras and the candles have to be switched out after each rental, even though they've only been used once. So, with permission of course, I've been taking the old ones to recycle into new candles. With my little container in place under the machine I started breaking up my candles. It said in the instructions to remove old wicking, which in these candles was impossible while they were solid. What I did instead was fish out the wicking with a Popsicle stick while the candles were melting. It was actually really easy and didn't take nearly as long as I had thought. I added dye and fragrance after the candles were completely melted, about 10 minutes for these ones. 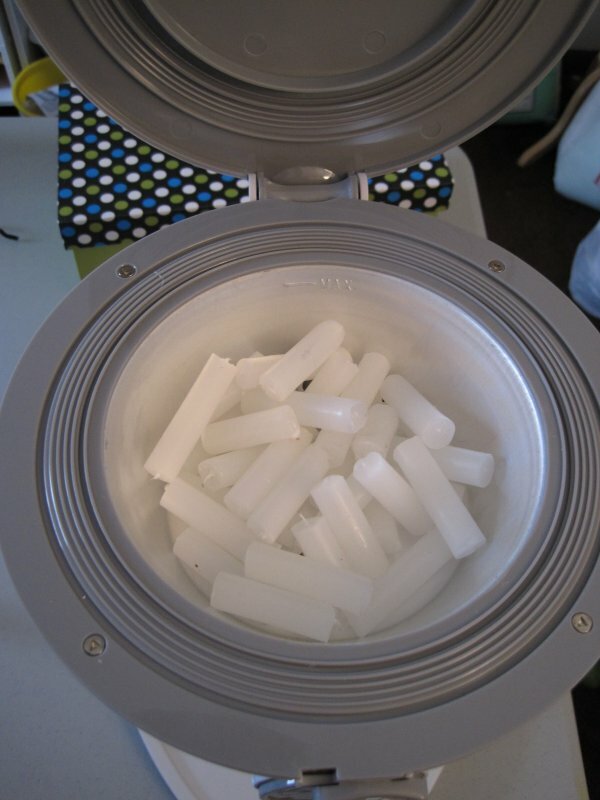 Then you open the valve and the wax pours into your container. 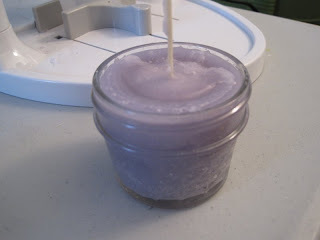 I used my Popsicle stick to stir in the fragrance and to prop up the wick in the container while the wax cooled so it wouldn't tip over. And that was it. :-) I haven't trimmed the wick down yet in this picture and I made a little bit of a mess on top of this one by getting impatient and not letting it cool enough before moving it (which resulted in some wax spillage. Patience is wonderful, my friends....), but I'd say overall it was a very successful first attempt.